Philadelphia “Streetgazing” photographer Reuben Harley has a big personality—and it goes pretty perfectly with his nickname: “Big Rube.” Since he hopped on a bike and started taking pictures, he has been documenting fashion on his photo blog and as a contributor to the Philadelphia Daily News, and runs his own on-the-street fashion photography website. 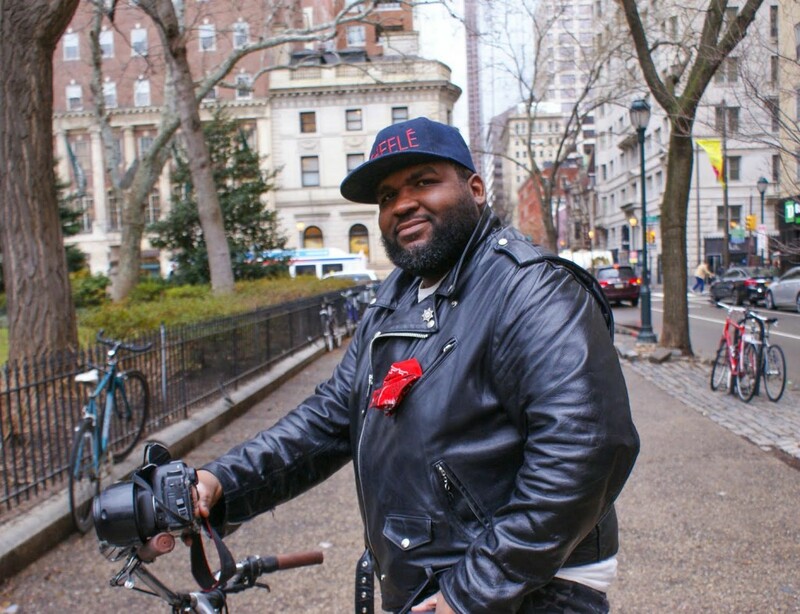 We caught up with Reuben in Rittenhouse Square for a quick chat about his relationship to bikes, photography and a few other things he has his hands in. Tell our readers a little about yourself. Who is Reuben Harley? I’m a renaissance man. That’s what everyone coins me. I do everything. I’m a brand marketer. I’m a chef, artist, photojournalist, everything under the sun that piques my interest and is just an extension of my creativity. My grandmother used to always get the New York Times and I used to look at Bill Cunningham’s columns. Six years ago, my brother bought me a camera for my birthday and then it was like WOW! I love Gordon Parks. I love Bill Cunningham’s stuff so let me just ride around, peek my interest and start snapping. I’m a crazy BMX fan. I watched the movie “Rad” in the 80s when I grew up, and that was it. Urban cycling, this is it. It goes along with my creativity. Have you been able to integrate photography with bicycling? That’s like my whole moniker. It’s street-gazing. That’s how I get around Philly. If you look on my blog, Streetgazing.com, you see the header photo is me shooting a couple of ladies [while] on my bike. That’s all a lifestyle for me. Since you’ve started riding, how have you seen cycling conditions in the city improve? A whole lot. One, I can honestly say, you know me being a black male in the city, you wouldn’t ever see too many black people riding bikes in the city years ago—but I made it cool. Now I just see it more and more, you know what I mean? I like how there are more bike lanes everywhere, too. I actually take my bike and put it on Amtrak to go up for New York for Fashion Week and I’m riding around there and take care of my business up there. It’s 90 percent of how I get around. This interview is part of our March Member Drive. To learn more about how to become a member of the Bicycle Coalition of Greater Philadelphia, and our Member Drive, click here.